SRS Distribution Inc. plans to build a new corporate campus at the Hub 121 development at the northwest corner of the Sam Rayburn Tollway and Alma Road. The McKinney Economic Development Corporation (MEDC) announced today McKinney-based building products distributors SRS Distribution Inc. will build a new corporate campus at Hub 121, a 22-acre retail, restaurant, and entertainment development at the northwest corner of the Sam Rayburn Tollway and Alma Road. Construction is slated to begin this spring. MEDC offered SRS an incentive based on retained jobs, new jobs and an estimated total investment in the new corporate campus project. According to the incentive agreement, SRS will seek to create more than 150 new jobs during the next 10 years, according to a city release. 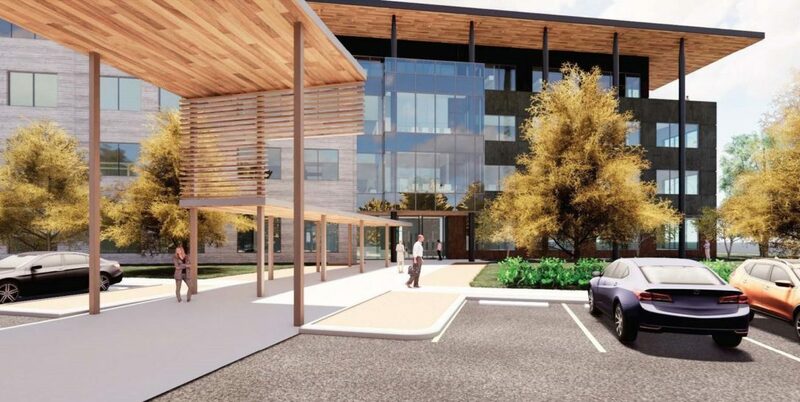 KDC will develop the four-story, 100,000-square-foot office building on a 4.2-acre property. “The MEDC board would like to thank CEO Dan Tinker and his leadership team for their continued commitment to McKinney. SRS is a leader in both their industry and community service. The SRS Raise the Roof Foundation supports The Samaritan Inn, Minuteman Disaster Response, and CASA of Collin County. We appreciate the contributions of SRS to our local economy and community,” said MEDC Chairman Ken Sipiora.